Boustead Holdings Bhd may build mixed commercial and residential properties worth more than RM8 billion on the 98ha Batu Cantonment army base at Jalan Ipoh, Kuala Lumpur. The group's main shareholder Lembaga Tabung Angkatan Tentera (LTAT), which holds a 59 per cent stake, is in talks with the government to buy the land and is close to sealing the deal. Boustead deputy chairman and group managing director Tan Sri Lodin Wok Kamaruddin is hopeful that it will be involved in the land development. "Hopefully the deal could be secured soon. Everyone is working hard to make it happen. 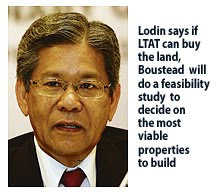 If LTAT can buy the land, we will do a feasibility study to decide on the most viable properties to build," he said. "It is a good site for a mixed development. It would be the kind of project that one would want to pursue on this prime land," Lodin told Business Times. He said Boustead may build medium to high-end houses, commercial and residential towers, shophouses, small office/home office and a mall. The government is selling some of its prized land bank around Kuala Lumpur and the Klang Valley at current market value for redevelopment. These include the Batu Cantonment land, 24ha at Jalan Cochrane, the 1,320ha Rubber Research Institute land in Sungai Buloh, and smaller parcels at Jalan Stonor, Brickfields, and Bukit Ledang, off Jalan Duta. It is unclear how much the Batu Cantonment land is worth but according to Previn Singhe, founder and chief executive officer of Zerin Properties, the market value for unconverted land at Jalan Ipoh is now between RM40 and RM80 per sq ft.
Previn said the development will attract foreign investments as it is closely located near the KLCC. "The shear size of the development offers a lot of promises. Prices of real estate along Jalan Ipoh have always been stable with good movement ... it's not as docile as how one thinks. "This project will have a positive impact on Jalan Ipoh if done well and if the developer can tap on the commuter line nearby, and the proposed Kepong-Kajang line," Previn said. The Batu Cantonment army base, which has been there for over 40 years, will be relocated. In 2002, the Perak state government had earmarked a 680ha site in Batu Gajah for the relocation.